Jason Akeson, The Most Interesting Man In The Playoffs? With as many playoff games under his belt now as regular season tilts, it’s been quite the week for Flyers forward Jason Akeson. The 23-year-old has gone from goat to hero, inexperienced to redeemed, and vastly unknown to possibly the most interesting man in this year’s playoffs. If the first two games in Philadelphia’s first-round series against the New York Rangers is any indication, Akeson figures to be part of a thickening plot. Madison Square Garden can be an intimidating venue, especially if you’re a member of the Philadelphia Flyers, who hadn’t won there in nine straight tries before pulling even in their playoff series against the Rangers. The stage becomes even boisterous for a youngster making his NHL postseason debut like Jason Akeson. Interestingly enough, the 5-10, 190 pound right winger made the playoff roster, despite appearing in just the season finale thanks in part to the ineffectiveness of Steve Downie and Tye McGinn. Nonetheless, Akeson and his high-sticking double-minor penalty to Carl Hagelin in Game One was the initial tremor that caused the avalanche of penalties in the third period. The Rangers would go onto capitalize on Akeson’s extended time in the box, and the rest was history. But instead of folding like a futile poker hand, Akeson triggered an inept Flyers squad to a critical victory in Game Two at MSG. In the first two games of the series, it’s been Akeson who’s gotten the ball rolling for the Flyers. In Game One, it was the snowball that rolled down hill, resulting in four third period called on the Flyers. In Game Two, however, it was the bowling ball that led to two more unanswered goals, evening the series. Matched with Couturier and Matt Read, Akeson and his linemates were able to generate noticeable chemistry, despite Akeson logging only 9:06 of ice time. And armed with coach Craig Berube’s vote of confidence, Akeson was able to fight off the pressure of playing playoff hockey in New York, as the visiter to boot. Akeson’s second period power play goal not only served as the equalizer, but shifted the game’s, and possibly the series’ momentum. That’s not to say that Akeson’s only contributions came from his first career NHL playoff goal, though. Some, including teammate Jakub Voracek, acknowledged the rookie as the best player on the ice for the Flyers in Game One, even with his four minute offense to the grill of Hagelin. “Aside from the penalty, of course. He played most of the game with Sean Couturier and Matt Read — that’s the Flyers tough-minutes defensive unit, by the way — and he seemed to make an impact every time he hit the ice. He out-skated the Rangers pretty consistently and created some offense. While some will, and have, scapegoated Akeson for Philly’s fall in Game One, his composure and poise cannot be questioned. The Adirondack Phantoms’ all-time leading scorer is far beyond the average 23-year-old maturation-wise, which is evident in his outlook and how he goes about handling the inevitable hiccups that strike every pup in the league. “I am sure [the media] kept talking about it and harped on it, but he did a good job of forgetting about it and I thought he played a great game tonight,” added forward Wayne Simmonds. 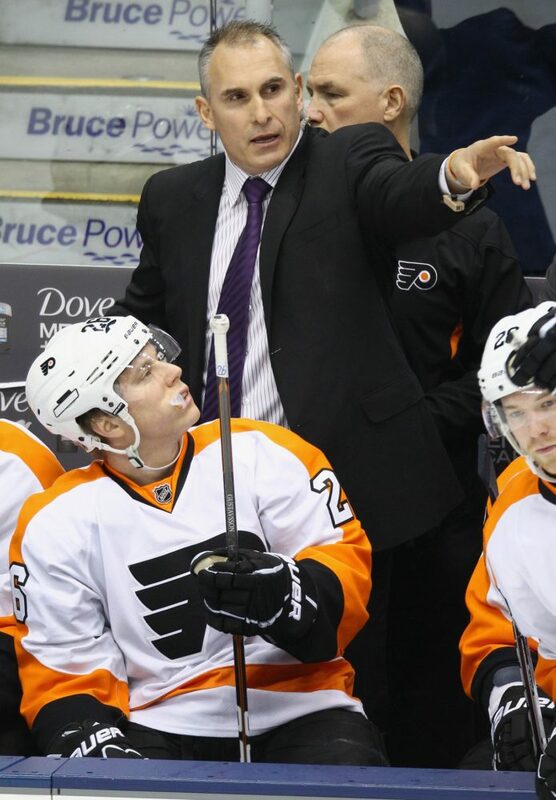 Akeson’s plot twist was made possible, of course, by coach Craig Berube. After recording an assist and 13:22 of ice time in his lone regular season game, Berube tapped the Ottawa native for the Flyers’ final playoff roster spot. With such a small sample size in NHL time, there must have been other evidence that led to Berube’s not-so-surprising decision. 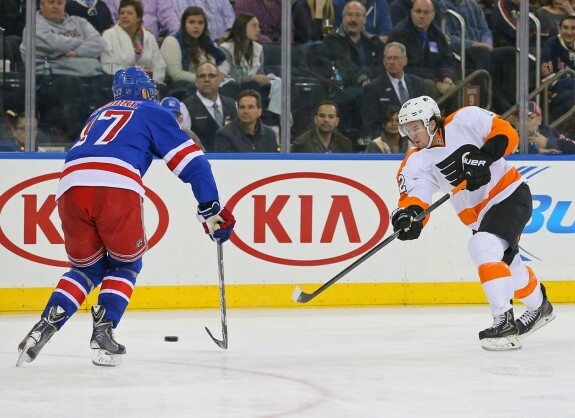 “This was no easy fill-in on the Flyers’ top shutdown line. Also, you have to consider Akeson was handed one shot to make an impression before the playoffs begin. That’s pressure. ‘I just wanted to make an impact and kinda show what I got and what I’ve been working hard all year for,” the native of Orleans, Ontario said. “If it does come and you get that call, you got to be ready. In addition to Akeson’s impact through one regular season NHL game this season, his 24 goals and 40 assists through 70 games for the Adirondack Phantoms was enough to garner his consideration. With 10 goals coming on the special teams units (7 power play goals and 3 shorthanded goals), Akeson was the change of pace Berube was looking for in lieu of Steve Downie, who’s struggled to stay healthy throughout the course of the season. Still, opting for an alternative to Akeson after his costly penalty in Game One could’ve easily been chalked up as nothing more than an ongoing attempt to juggle personnel to fit in with the Couturier-Read line. After all, with names like Max Talbot, Steve Downie, and Tye McGinn all in and out of the lineup, what’s one more change? But much to Philly’s delight, Berube stuck with the rookie, proving to be one of the many decisions made by Berube that would prove beneficial. “I know he (Berube) had my back there and he kind of just let me do my thing. Yeah, he talked to me. So that was good,” added Akeson. Heading back to Philadelphia for Game Three, it’s arguable that the most interesting man in the playoffs is a 23-year-old rookie who has a total of four NHL games played. And while Colorado’s Nathan MacKinnon may be the popular choice, he’s also more established. Is that really “Most Interesting” worthy in comparison? Jason Akeson may not be appearing in any Dos Equis commercials anytime soon, but showing up in the playoffs is all he prefers anyway. Interesting or not, Akeson appears to be in Philadelphia to stay.